A complete & perfect Health Education Series. 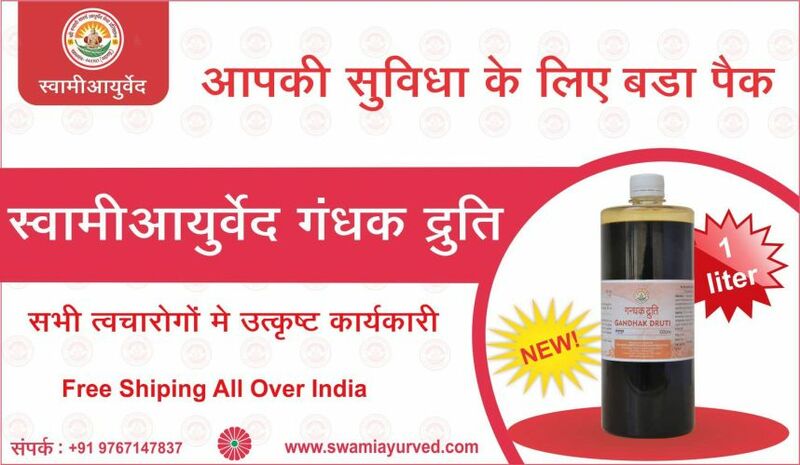 lets you know the true colours of Ayurved in a informative way. This is A photo series of aphorisms & quotations in Ayurved related to our daily life & health maintenance. Eating well, proper exercise, and sound sleep help maintain a healthy body and mind. 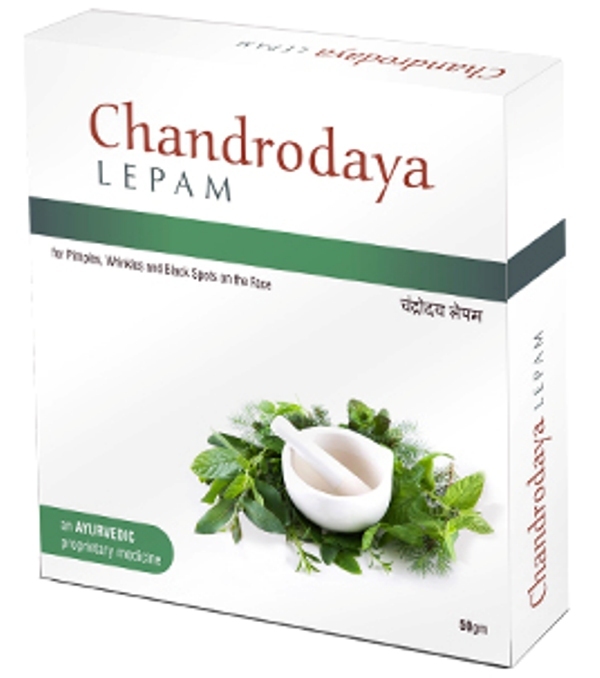 Chandrodaya Lepam is our proprietary product specially designed to cater the needs of youngsters. A teenager is mainly annoyed by the problem of pimples on his/her face. He/She always wants to be smart & charming. But all his/her wishes remains to be a dream only because of unwanted appearance of pimples. The subsequent emergence of black spots (blemishes) adds fuel to the already worsening condition. But now pimples and blemishes is no longer a problem at all. Just use Chandrodaya Lepam and forget about it. Chandrodaya Lepam clears all types of Acne & blemishes too that too�. in pure natural way. So there is no need to use any other chemical based cream or ointment for removing blemishes on the face or anywhere on the body. Just apply the Chandrodaya Lepam as per the given indications on the box or as directed by your physician and BE ASSURED � YOU ARE SURE TO GET RID OF THE ACNE & BLACK SPOTS. 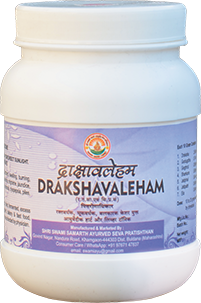 Drakshavaleha is a classical Ayurvedic formulation referred in Rasatantrasaar & Siddhaprayoga Sangraha. It is widely used in all types of Pitta disorders (Disorders due to excess heat in the body). The benefit of this formulation is its delicious taste making it more palatable & acceptable in children too. Original Keshar and organic black grapes of superior quality are used in our Drakshavaleha. This is the secret behind its excellent efficacy & desired results in patients. It relieves chronic hyperacidity with proper dietetic guidance by an expert Ayurvedic doctor. It pacifies the Pitta disorders associated with Kapha & Vata. Contraindicated in diabetic patients. 3 gm or as directed by physician. Erand Tailam (Siddha) is our simple yet effective and unique product because of its contents i.e. Guduchi & Shunthi. 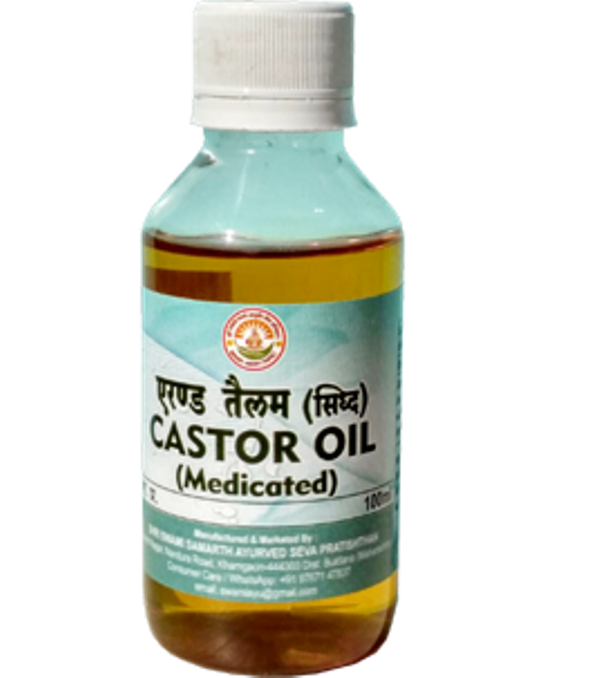 Erand Tailam (Castor oil) when used alone created smooth muscle spasms in the abdomen due to its extra viscous consistency. Moreover it has a natural unpleasant smell (?????) which causes the patient to stay away from it even though it is the best available purgative in Ayurveda. Both of the above demerits are nullified to a great extent when it is processed with Guduchi and Shunthi. This processing with Guduchi & Sunthi increases its therapeutic efficacy & thus widens its applicability in more number of diseases. It can be used in all types of painful joint disorders, skin disorders, psychiatric illnesses & GI tract disorders. Classical Virechanam & Sadyovirechanam can be performed by using Siddha Erand Tailam without any fear of untoward effects. Gandhak Druti is our own proprietary product. The classical Gandhak Druti is different than this one, however the spectrum of indication is same, rather somewhat broad than the classical Gandhak Druti. 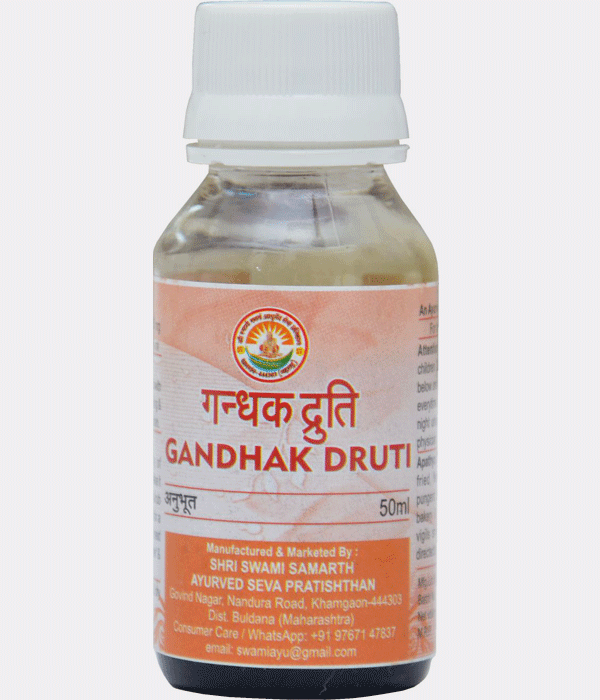 Classical Gandhak Druti is mostly indicated in Respiratory disorders, whereas Swami Ayurved Gandhak Druti can be administered in all the disorders where the use of Shuddha Gandhak is indicated. chronicus, urticaria and worm infection, infectious chest disorders, typhoid etc. Externally a massage with gentle pressure can be advised to all kinds of skin patients. It can be used to dress the open cuts , wounds & even burned skin with properly sterilized gauze. All types of dry , itchy , oozing & scaling skin disorders can well be treated with its local application. It is having honey-like consistency so it stays on the body all along the day and works well. However its odor is somewhat unpleasant. So a light perfume on the clothes may be used to mask the typical odor after its application. It has been tried many times in lichen planus & found to be extremely effective. Regular twice a day massage relieves the severe itching by 50% on the 4th day itself. 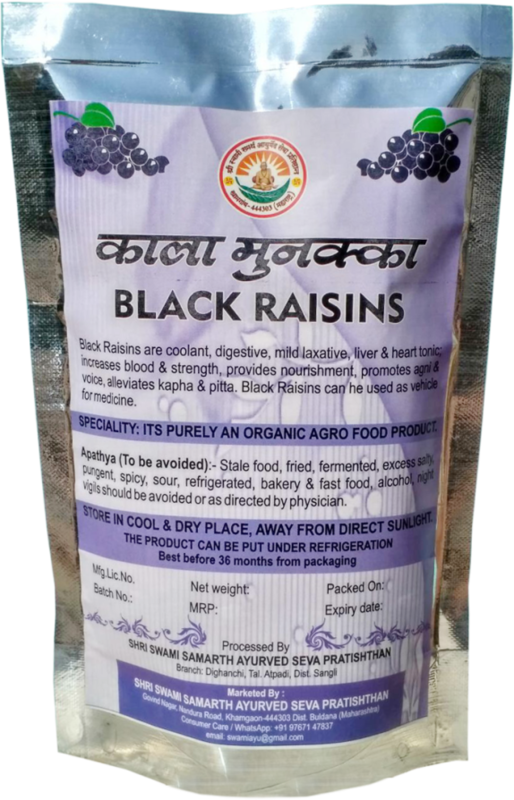 Kala Munakka (Black Raisins) is an organic agro food product of SwamiAyurved. It is cultivated and processed without any type of chemical and that's why it excels in all other varieties available in market. Its smooth, juicy and extremely sweet. Being organic, it doesn't need any special care like refrigeration. It can be stored at room temperature in cool, dry and hygienic open place. Kala Munakka is not just a dry fruit. Additionally it has many medicinal properties. It can be used in Amlapitta (Hyperacidity), Bhrama (Giddiness), Kamla (Jaundice, hepatitis), Raktapitta (All hemorrhagic disorders), Daha (Burning anywhere in body), Jwara (Fever), Shwasa (Asthma), Kshata (Stomach or duodenal ulcer, Ulcerative Colitis), Kshaya (Cachexia of any origin), Vata-paittika shiroshula (Migraine like headache), Kasa (Coughing), Udavarta (Severe constipation), Swarabheda (Hoarseness of voice) & so many other disorders. The soup prepared from Kala Munakka can be used as a vehicle in above diseases and many other disorders. All guggula preparations (Like Mahayogaraja Guggulu, Trayodashanga Guggulu, Punarnava Guggulu) should be taken alomg with Kala Munakka soup. The alcoholic hangover is best treated with the soup of Kala Munakka. The regular consumption of Kala Munakka soup in the morning before going to walk or jogging keeps the Mamsa Dhatu fit & healthy and hence it's advisable in all types of skin diseases also. Its purely organic agro product. Can be taken as much as someone need it and like it. Keshikai is our proprietary Ayurvedic formulation containing herbs like Shikakai, Aritha, Nimba, Awala & many other herbs. Since ages these herbs are used traditionally to wash hairs, strengthen hairs roots. 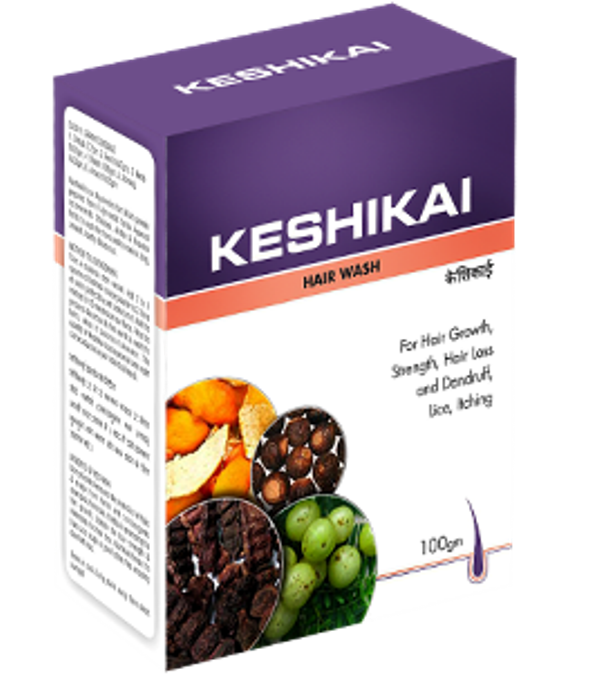 Keshikai Kwath (decoction) ensures a chemical free wash for your hairs which preserves the integrity of hairs and promotes its growth. 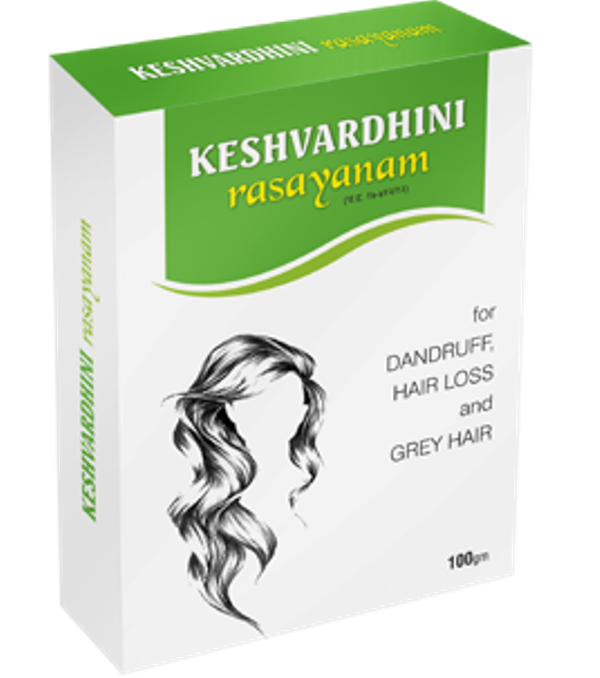 Its natural way to nourish your hairs and the best available treatment for dandruff; lice and dandruff induced itching. Its best option to wash the hairs clogged due to secretions in Seborrheic dermatitis & Pemphigus vulgaris. The scalp psoriasis is well controlled with the use of Keshikai Hairwash. The directions for use have been printed on the box for your convenience. Take a stainless steel vessel. Add 2 to 3 spoons of Keshikai Hairwash to 2 litres of water (Preferably soft water) in it. Boil the mixture for 15 minutes on low flame. Filter the prepared decoction and then wash the hairs as it becomes lukewarm. The quantity of Keshikai Hairwash coarse powder and water can be adjusted as per individual needs. 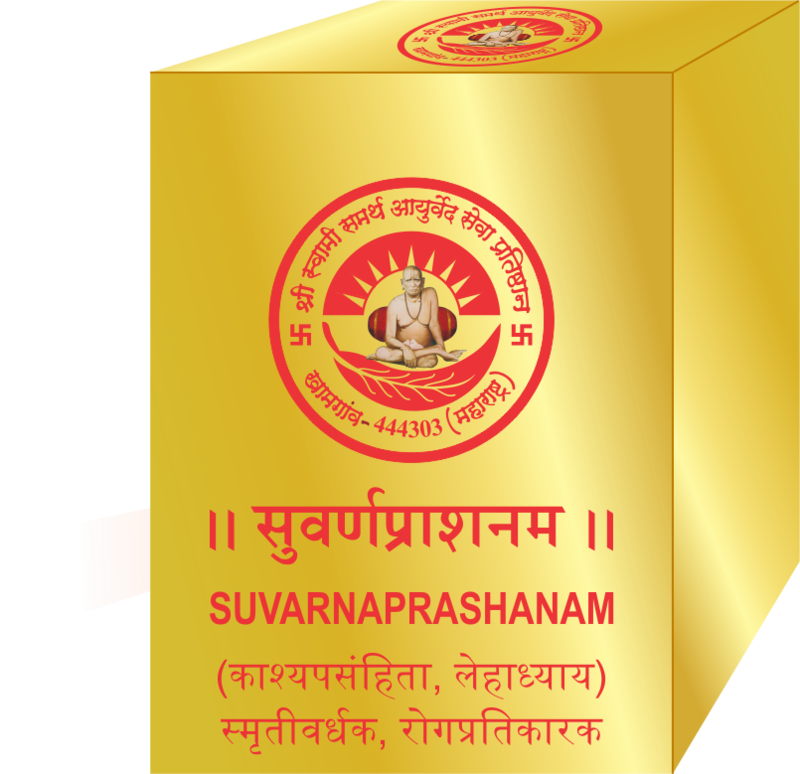 SwamiAyurved Suvarnaprashanam is our proprietary medicine prepared in a classical way as described in Kashyapa Samhita Lehadhyaya. Kashyapa samhita recommends the continuous use of Suvarnaprashanam for children from the first day of life to 6 months. 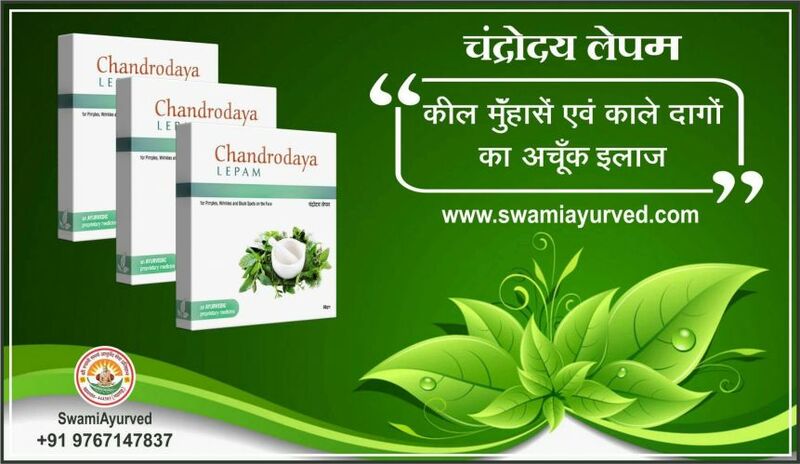 SwamiAyurved has fortified the classical formulation with immunity enhancing & memory boosting drugs & designed it in a way that it can be administered daily in any age bracket. 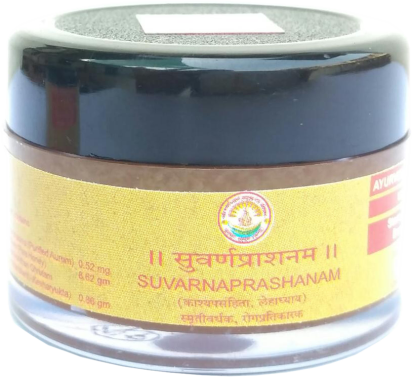 This unique blending has made SwamiAyurved Suvarnaprashanam a broad spectrum health tonic. Hence it can be given in each & every disease. Furthermore being a supreme Rasayana, it can be given daily to maintain strong health & keep diseases away. 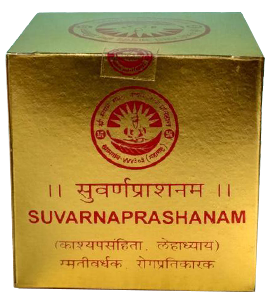 SwamiAyurved Suvarnaprashanam is available in Avaleha (honey like consistency) form as per the directions of ancient classics whereas the market is flooded with some drop forms to which idea Ayurveda has never subscribed. The Avaleha form mixes immediately with saliva ensuring the faster absorption and better availability to the body tissues. Pragyavivardhanam Ghritam provides a better base for the action of Suvarnaprashanam in autoimmune diseases & various psychological disorders. So every disease where autoimmune angle of the disease come in to picture should be dealt with SwamiAyurved Suvarnaprashanam. It�s safe way to improve immunity & stabilize the results in steroid dependent conditions. Psychological aberrations are best treated with SwamiAyurved Suvarnaprashanam as an adjunct medicine provided SwamiAyurved Suvarnaprashanam is needed to give in large doses in Rasayana & Udana Kala. The micronized Suvarna Bhasma nourishes all the Dhatus therebymaking the Manovaha Srotasa strong & immune to sudden emotional attacks. This is era of antibiotics & analgesics. Every single disease is treated with antibiotics and analgesics. It has made the human body susceptible to very common infections which are frequent throughout the year nowadays. SwamiAyurved Suvarnaprashanam reduces the frequency and keeps you healthy. SwamiAyurved Suvarnaprashanam is best Ayurvedic medicine available to treat infertility problems. It can be used alone or with other associated medicines. Even in pregnancy SwamiAyurved Suvarnaprashanam can be used safely & effectively to keep infections away and to keep the baby in uterus healthy. It also helps for the proper development of foetus.